Could Your Seafood Contain Toxic Chemicals? 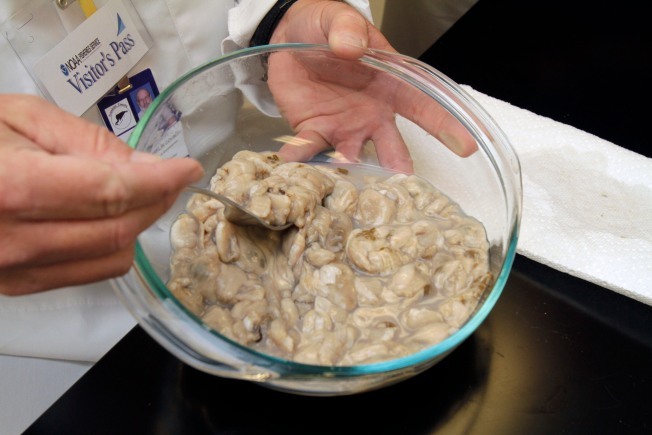 William Mahan of the University of Florida holds a bowl of oysters at NOAA's seafood inspection program in Pascagoula, Miss. Thursday, June 3, 2010. There is renewed scrutiny of seafood from abroad. When you think of tainted seafood, you may think of the Gulf oil spill. But 80 percent of the fish and shrimp Americans eat actually comes from overseas — and a TODAY investigation that aired Tuesday found that some of that seafood may contain toxic chemicals that can cause serious health problems. Footage taken by a U.S. advocacy group of seafood being raised in Vietnam, for example, showed fish in dirty sewage water, pumped with toxic antibiotics and banned drugs just to keep them alive, boosting production and driving down costs. State tests in Oklahoma, Mississippi and Georgia show similar results, all targeting seafood with the worst record of contamination: shrimp, catfish, crabmeat and tilapia imported to the U.S. from China, Taiwan, Vietnam, Malaysia and Indonesia — ending up in American restaurants and grocery stores in many cases, officials say. Scientists say that over time, eating seafood contaminated with such chemicals could cause anemia, cancer and even birth defects. The Food and Drug Administration says that the risks are long-term and not fully understood. While the FDA is responsible for keeping the nation’s food supply safe, TODAY’s investigation found that the FDA tests less than 2 percent of imported seafood. “I would certainly suggest that the FDA do more,” Sparks said. The FDA declined to speak with TODAY on camera, but said it is doing the best it can, targeting its testing on companies and countries that are repeat offenders and rejecting their products until they are proven safe. Yet the problem keeps happening: In fact, according to test results obtained by NBC News, this year alone 8 percent of the seafood the FDA tested from China was tainted, and 16 percent of seafood tested from Taiwan was tainted. Connelly said most importers follow the rules, and that the problem is being overblown as a trade issue. “Unfortunately, there are bad actors in every industry,” he said. Federal law requires grocery stores to identify the country of origin of the seafood they sell, but in restaurants, it's a different story: Most states do not require them to tell patrons where the seafood they serve comes from. Connelly said that “studies do not indicate that Americans are deeply interested in the source of their fish or other proteins. “I think that consumers should feel comfortable that the FDA does a good job,” he added. And officials say it is not just a health issue. American fishermen who play by the rules say they’re losing their jobs because they can't compete with importers who cut corners and sell their tainted fish much cheaper in the U.S.
To read a statement from the FDA in response to TODAY’s investigation, click here.